Objectives To evaluate the critical quality attributes that might affect the stability of an infliximab biosimilar (SB2, Flixabi) when reconstituted or diluted and stored under refrigeration and at room temperature. Methods We largely adhered to the UK's National Health Service guidance requirements for the design of a robust stability study and for robust testing methods. Protocol components included evaluation of visual appearance, chemical stability, physical stability, pH, particle sizes and biological activity. The stability of reconstituted SB2 was assessed for 60 days at 5°C and for 7 days at 25°C. 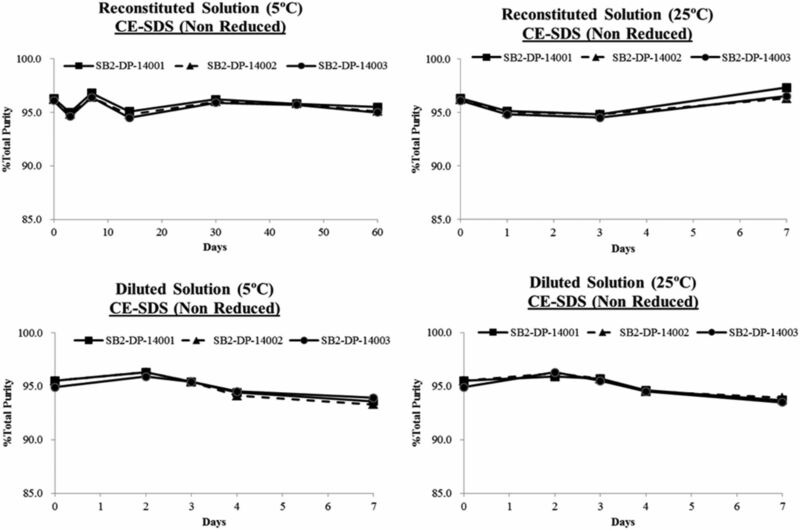 Stability of diluted SB2 at concentrations that ranged from 240 mg/250 mL (3 mg/kg; 80 kg patient) to 400 mg/250 mL (5 mg/kg; 80 kg patient) was assessed for 7 days at both temperatures. Dilutions were made in polyethylene bags containing 0.9% NaCl. Forced degradation studies were conducted with SB2 and its reference product (USA-sourced and European Union-sourced Remicade). Stress conditions of heat or light occurred before product reconstitution. Results In a laboratory environment under aseptic conditions, stability acceptance criteria with regard to physicochemical and biological properties were met for all reconstituted and diluted SB2 samples for all time periods and temperatures assessed. After either heat or light stress, similar stability and biological activity were noted for SB2 and both reference products. Conclusions When prepared under aseptic conditions in accordance with the product's Summary of Product Characteristics, exposed for prolonged periods at 5°C and 25°C and assessed with the described methods, SB2 appears to remain a stable monoclonal antibody maintaining its expected biological function. Infliximab (Remicade; Janssen Biologics BV, Inc, Leiden, Netherlands) is a chimeric human-murine IgG1 monoclonal antibody that acts as a cytokine modulator whose binding to soluble and transmembrane forms of tumour necrosis factor α (TNF-α) reduces the proinflammatory signalling of this cytokine.1 Flixabi (infliximab, SB2; Samsung Bioepis UK Ltd (SBUK), Chertsey, UK; Renflexis, Samsung Bioepis Co., Ltd, Incheon, Korea) is a biosimilar that has been approved by the European Medicines Agency.2 Pharmacokinetic equivalence between SB2 and its reference product (Remicade) has been demonstrated in healthy adults and the efficacy and safety of SB2 have been shown to be comparable to that of the reference product in a randomised, double-blind, phase III trial of patients with moderate to severe rheumatoid arthritis.3 ,4 The indications for this biosimilar are the same as those for the reference product. Three lots of SB2 (SB2-DP-14001, SB2-DP-14002 and SB2-DP-14003) were used. In accordance with the product label, each vial of SB2 was reconstituted aseptically with 10 mL of water for injection delivered by a 21-gauge or smaller needle and a 10 mL Kovax syringe (Korea Vaccine Co., Ltd).2 The contents of one reconstituted vial were then transferred by sterile needle and syringe to microtubes and stored at −70±10°C until the day of analysis. Two vials of reconstituted SB2 were stored at 5°C before evaluation of product appearance and particulate matter. The remaining 27 vials of reconstituted SB2 were stored in the absence of light either in a 5°C stability chamber for 60 days (18 vials) or in a 25°C stability chamber for 7 days (9 vials). NHS guidance calls for refrigerated storage in the absence of light and at room temperature defined as 25±2°C for a storage period normally of 48 hours to 3 months.5 Samples were analysed on the day of test product preparation (day 0, initial time point) and then on days 3, 7, 14, 30, 45 and 60 of incubation at 5°C and on days 1, 3 and 7 of incubation at 25°C. The recommended starting doses (ie, initial concentrations) are 3 or 5 mg/kg, depending on the indication for use. Therefore, a patient weighing 80 kg would require an initial dose of 240 mg or 400 mg of SB2. In accordance with NHS guidance, a low and a high clinically significant concentration were evaluated: 240 mg/250 mL and 400 mg/250 mL of SB2.5 In addition, a mid-concentration (320 mg/250 mL), corresponding to a 4 mg/kg dose for a patient weighing 80 kg, was evaluated. One lot of SB2 was used for each concentration. After reconstitution of SB2 and storage of all vials at 5°C for 24 hours, two bags of each concentration were aseptically prepared. For the polyethylene infusion bags that were to contain the 240 mg dose of SB2, 24 mL of 0.9% NaCl was withdrawn and discarded; then 240 mg of SB2 in 24 mL was added. A similar procedure was repeated for the 320 mg dose and the 400 mg dose. After inversion, a 20 mL sample (day 0) was collected from each bag and additional assessments were made on days 2, 3, 4 and 7 at both temperatures. The manual visual inspection hood MIH DX (Bosch Packaging Technology) was used to inspect the colour (yellow standard: Y1–Y7) and clarity (turbidity standard: 3 nephelometric turbidity units (NTU)–18 NTU) of samples and to look for visible particles. The osmolality of samples was tested with a 2020 Multi-Sample Osmometer (Advanced Instruments, Inc), which was calibrated to 50, 100, 500 and 850 mOsm/kg before use. Reconstituted samples were evaluated with a Seven Excellence pH Meter and In Lab Expert Pro-ISM (a combination pH electrode and temperature probe; Mettler Toledo), which were calibrated to pH 4.01, 7.00 and 9.21 before use. All samples were diluted to a concentration of 1 mg/mL, based on the expected concentration of each sample in 0.9% NaCl. Absorbance at a wavelength of 280 nm (A280) was measured by a UV-VIS spectrophotometer (SHIMADZU). For normalisation, 0.9% NaCl served as the blank solution. Samples were injected onto a TSK gel G3000SWXL column (5 µm/7.8 mm×300 mm; Tosoh) with a flow rate of 1.0 mL/min and a mobile phase that consisted of 100 mM sodium phosphate and 500 mM l-arginine monohydrochloride, pH 6.8. UV detection (wavelength, 280 nm) was performed. Samples were treated with carboxypeptidase B for 2 hours to remove the unprocessed Lys residue at the C terminus of the heavy chain. Using a capillary cartridge at 4°C, the mixture was loaded onto the imaged capillary isoelectric focusing instrument. The anolyte was 0.08 M H3PO4 and the catholyte was 0.1 M NaOH. Capillary electrophoresis-sodium dodecyl sulfate analyses were conducted in non-reducing conditions with a high-performance capillary electrophoresis system (PA 800 plus Pharmaceutical Analysis System; Beckman Coulter, Inc). Each sample was electrokinetically introduced onto a capillary (50 µm/30.2 cm; Beckman Coulter, Inc). UV radiation (wavelength, 220 nm) passed through the capillary window and aperture (144712, 100×200 µm; Beckman Coulter, Inc) and was detected by the PA800 Plus. TNF-α binding by samples was measured by time-resolved fluorescence resonance energy transfer. A competitive inhibition assay that included a europium (Eu) chelate-labeling, fluorophore Cy5-labelling system was used to measure TNF-α binding activity. Infliximab and TNF-α were labelled with fluorescent Eu chelate and Cy5 fluorophore, respectively. Eu-labelled infliximab bound to Cy5-labelled TNF-α, generating a fluorescence signal. Unlabelled SB2 competed with Eu-labelled infliximab to bind to Cy5-labelled TNF-α; binding of unlabelled SB2 to Cy5-labelled TNF-α resulted in inhibition of fluorescence. Measured fluorescence is inversely proportional to the binding of unlabelled infliximab. Fixed concentrations and volumes of Eu-labelled infliximab and Cy5-labelled TNF-α were added to the assay plate and incubated at ambient temperature with moderate agitation. The plate was read by a microplate reader using Envision and relative binding activity was calculated by parallel line analysis software. TNF-α neutralisation by SB2 was evaluated in assays using a luciferase reporter gene system. SB2 was preincubated with TNF-α and subsequently incubated with an engineered cell line that contained the luciferase reporter gene. TNF-α was mixed with the assay standard, the control and the infliximab-treated samples in a 1:1 ratio (v/v); each mixture, which was in 96-well tissue culture plates, was incubated at room temperature for 30–120 min. After incubation, the engineered cell line was transferred to each well. Cells and the antigen–monoclonal antibody mixture were incubated for 24 hours at 37°C. Luciferase activity was measured by a Steady-Glo Luciferase Assay System. Data were analysed by parallel line analysis software, which calculates relative potency. Particles ≥10 µm and ≥25 µm in size were counted with a HIAC 9703+ and HRLD 400 instrument (Beckman Coulter, Inc). The lyophilised product was exposed to heat (40±2°C, 75±5% relative humidity and light-protected) and the tests for biological and physicochemical analyses were conducted on reconstituted samples at baseline and at months 1, 3 and 6. For exposure to light, lyophilised SB2 was exposed to at least 1.2 million lux hours of cool white fluorescent lamp light and then to 200 Wh/m2 of near-UV lamp light at 25±2°C and 60±5% relative humidity before placement in light-protected temporary storage at 5±3°C. Dark control samples were wrapped in aluminium foil to protect them from illumination.7 After reconstitution, the tests for biological and physicochemical analyses were conducted. For oxidation, reconstituted SB2 samples were treated with 0.1% hydrogen peroxide and incubated at 5±3°C for either 3 or 6 hours. The percentage oxidation of each methionine (Met) residue was determined. Reference products (US- and EU-sourced Remicade) were also used for all three tested stress conditions. No precipitates or particulate matter were detected by visual inspection. 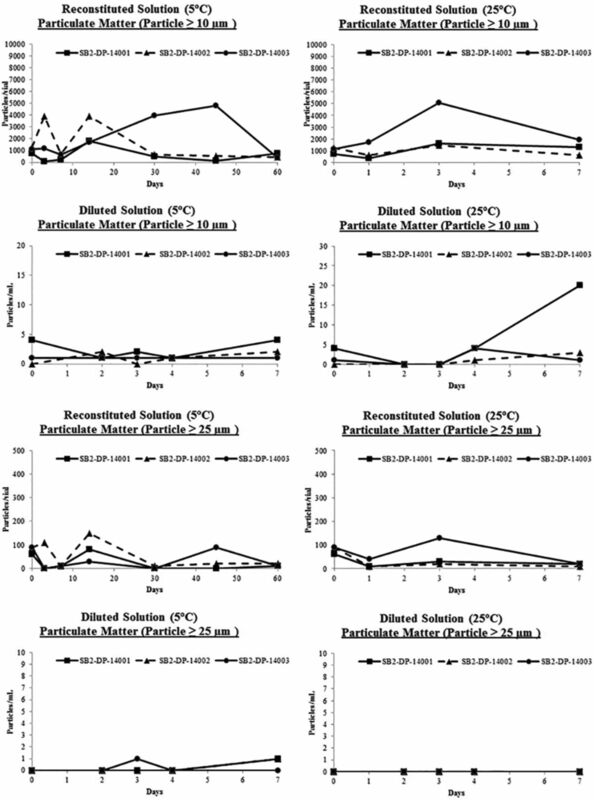 No change in colour or clarity, minimal (±0.1 pH units) change in pH and no substantial change in osmolality were observed for either reconstituted or diluted SB2. The measured protein concentration for either reconstituted or diluted SB2 was similar to the expected concentration (figure 1). 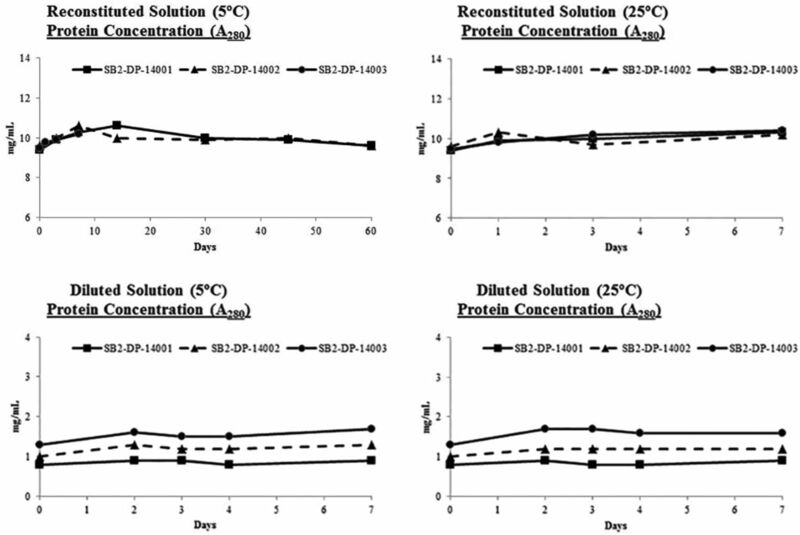 Results of the protein concentration assay for reconstituted solutions at 5°C and 25°C, and for diluted solutions at 5°C and 25°C. No major change was noted in the proportion of high molecular weight (HMW) impurity; in the total purity; or in the %Acidic, %Main and %Basic profiles of the protein for either reconstituted or diluted SB2 (figures 2⇓–4). All data met the stability criteria. 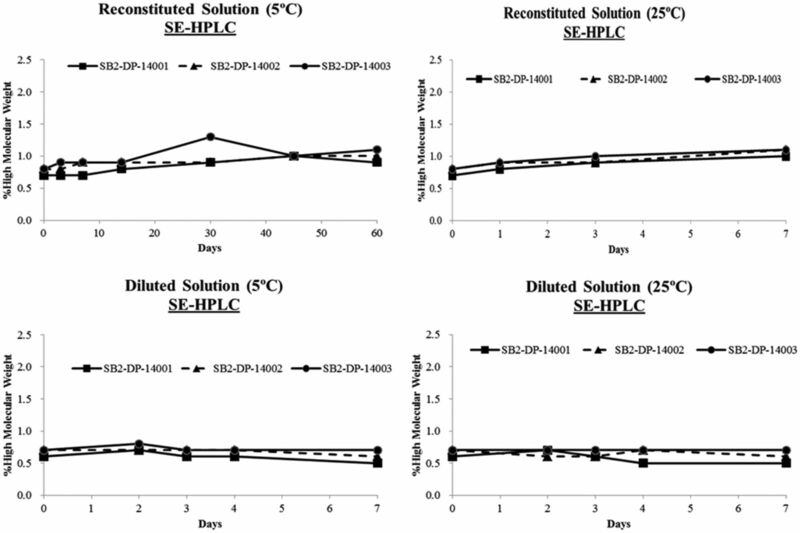 Results of the size exclusion high-performance liquid chromatography (SE-HPLC) for reconstituted solutions at 5°C and 25°C, and for diluted solutions at 5°C and 25°C. Results of the capillary electrophoresis-sodium dodecyl sulfate (CE-SDS) for reconstituted solutions at 5°C and 25°C, and for diluted solutions at 5°C and 25°C. Results of the imaged capillary isoelectric focusing (icIEF) for %Acidic for reconstituted solutions at 5°C and 25°C, and for diluted solutions at 5°C and 25°C. Results for %Main for reconstituted solutions at 5°C and 25°C, and for diluted solutions at 5°C and 25°C. Results for %Basic for reconstituted solutions at 5°C and 25°C, and for diluted solutions at 5°C and 25°C. No substantial changes for either reconstituted or diluted SB2 were noted in the relative binding activity in the TNF-α competitive inhibition assay or in the relative potency in the TNF-α neutralisation assay (reporter gene expression assay) (figure 5). The stability acceptance criteria were met for all measurements. Results of the competitive inhibition binding assay to tumour necrosis factor-alpha (TNF-α) by fluorescence resonance energy transfer (FRET) for reconstituted solutions at 5°C and 25°C, and for diluted solutions at 5°C and 25°C. 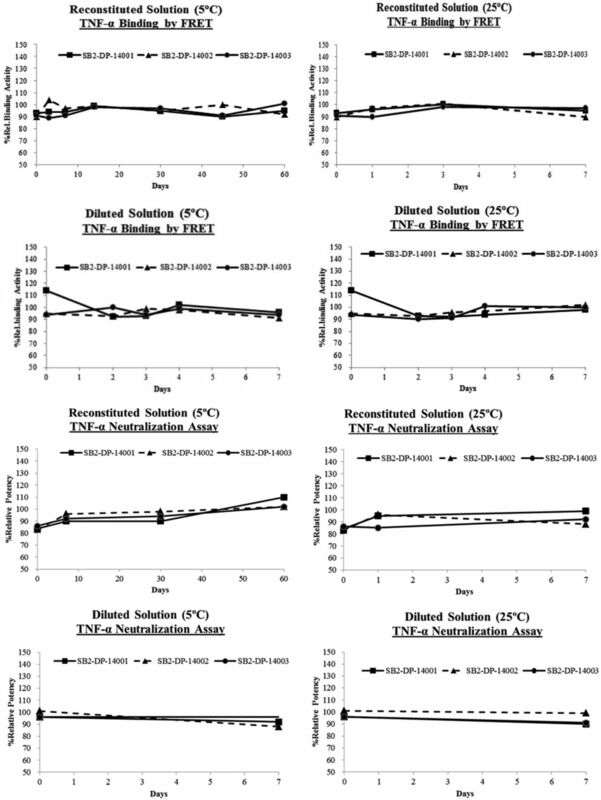 Results of the TNF-α neutralisation assay using a reporter gene system for reconstituted solutions at 5°C and 25°C, and for diluted solutions at 5°C and 25°C. The stability acceptance criteria were met for particles ≥10 µm and ≥25 µm for both reconstituted and diluted SB2 (figure 6). Results of quantification of particles ≥10 µm for reconstituted solutions at 5°C and 25°C, and for diluted solutions at 5°C and 25°C. Results of quantification of particles ≥25 µm for reconstituted solutions at 5°C and 25°C, and for diluted solutions at 5°C and 25°C. Under light stress, similar %HMW, %relative binding activity and %relative potency, as well as comparable slight decreases in %total purity were observed for SB2 and reference products in the immediate packaging (glass vial, see online supplementary figure S1). Under heat stress, similar %HMW, %total purity, %relative binding activity and %relative potency were noted (see online supplementary figure S2). For oxidative stress, the Met oxidation rate of SB2 was similar to that of the reference products at each Met residue (see online supplementary figure S3). Met18 and Met255 residues were highly oxidised, Met55 was oxidised at an intermediate level and Met34, Met85 and Met431 residues were resistant to oxidation. Our study employed a design that is largely congruent with the NHS guidance requirements for a robust evaluation of antibody stability for a period of extended storage. The minimum testing protocol should include colour, clarity and particulates; pH; chemical stability; physical stability; subvisible particle level; biological activity and degradation.5 Neither the primary structure nor the higher-order structures were evaluated in this study because data from a characterisation study of reconstituted product found similar results for SB2 and its reference product (Samsung Bioepis Co., Ltd 2016). For the characterisation study, the primary structure of SB2 was evaluated with peptide mapping by liquid chromatography-electrospray ionisation-tandem mass spectrometry. Secondary and tertiary structural analyses using far- and near-ultraviolet circular dichroism, intrinsic fluorescence, Fourier transform infrared spectroscopy and differential scanning calorimetry were used to evaluate higher-order structure. Thus, in our study, we evaluated the critical quality attributes that might affect the protein's stability. Our data from this study and from the characterisation study may help to optimise the preparation of SB2 doses. Indicated doses of SB2 are weight-based and calculation of the number of vials needed based on the required dose is needed.2 The volume needed is based on the dose; the entire content of a reconstituted vial may not be needed. A limitation of our data is the use of the Kovax syringe to reconstitute SB2. First, the Kovax syringe is not used in a clinical setting and does not have a Leur-lock end. The guidance states that use of Leur lock syringes is desirable and that data generated are specific to the syringe and closure system used.5 In our laboratory study, the only closure system used was the manufacturer-produced product vial. Second, silicone is present in the plunger component of the syringe used. Silicone may affect protein aggregation.11 Our data from the size exclusion chromatography analysis did not show any relevant differences in aggregation. Exposure of drug product to silicone in the Kovax syringe was very limited, as the syringe was used only to reconstitute the product in the vial and to transfer the product to another container such as diluent bags. Third, the guidance recommends that syringes, with the plunger attached, should be filled to no higher than 90% of their marked capacity.5 Although the syringe was used only to reconstitute the product, the 10 mL Kovax syringe was filled to capacity, which might have caused undue plunger movement and, thus, compromised microbial integrity. Microbiological tests were not conducted on any of the samples, but all SB2 manipulation was done under aseptic laboratory conditions. Assessment of the physicochemical and biological aspects of the critical quality attributes determined to affect stability showed stability of reconstituted SB2 for 60 days at 5°C and for 7 days at 25°C. Stability of SB2 for 7 days was also demonstrated when diluted with 0.9% NaCl and stored in polyethylene bags at either 5°C or 25°C. According to the product's Summary of Product Characteristics, stability data are limited to demonstration of chemical and physical in-use stability of the SB2 reconstituted solution for 24 hours at 25°C. Therapeutic effects of monoclonal antibodies depend upon their structural integrity, so stability data for the monoclonal antibody SB2 are needed. Stability data from assessment of the physicochemical and biological aspects of the critical quality attributes considered to affect stability for both reconstituted and diluted SB2 solutions at either 5°C or 25°C for >24 hours were generated using a standard protocol for deriving and assessing stability from the UK's National Health Service Pharmaceutical Research and Development Working Group. Aseptically prepared SB2 in accordance with the product's Summary of Product Characteristics appears to remain a stable monoclonal antibody with its expected biological function when reconstituted and stored at either 5°C for 60 days or 25°C for 7 days or when diluted and stored for 7 days at either 5°C or 25°C. The data should be used in conjunction with the product's characterisation study data to provide a complete stability picture. Remicade (infliximab) summary of product characteristics. Janssen Biologics BV. July 2009. http://www.ema.europa.eu/docs/en_GB/document_library/EPAR_-_Product_Information/human/000240/WC500050888.pdf (accessed 1 Aug 2016). Flixabi® product information. Biogen. http://www.ema.europa.eu/docs/en_GB/document_library/EPAR_-_Product_Information/human/004020/WC500208356.pdf (accessed 2 Aug 2016). ., on behalf of the NHS Pharmaceutical Quality Assurance Committee. A standard protocol for deriving and assessment of stability, Part 2: aseptic preparations (biopharmaceuticals). 1st ed. Published October 2012. http://mabstalk.com/a-standard-protocol-for-deriving-and-assessment-of-stability/ (accessed 1 Aug 2016). International Conference on Harmonisation of Technical Requirements for Registration of Pharmaceuticals for Human Use. ICH harmonised tripartite guideline. Q1B. Stability testing: photostability testing of new drug substances and products. Published November 1996. http://www.ich.org/fileadmin/Public_Web_Site/ICH_Products/Guidelines/Quality/Q1B/Step4/Q1B_Guideline.pdf (accessed 1 Aug 2016). United States Pharmacopoeia. <788> Particulate matter in injections. Revision Bulletin. Published July 1, 2012. http://www.usp.org/sites/default/files/usp_pdf/EN/USPNF/revisions/788_particulate_matter_in_injections.pdf (accessed 7 Jun 2016). Ph.Eur.2.9.19. Particulate contamination: subvisible particles. In: European Pharmacopoeia. 8th edn. Strasbourg, France: European Directorate for the Quality of Medicines and Health Care, 2013;321–3. Contributors JK, JC, SP: study concept and design. JK, JC: data collection; data analysis and interpretation; manuscript writing. DK, SJ: critical reviewing of the manuscript at various stages of its development. All authors approved the final draft of the manuscript. Funding This work was funded by Samsung Bioepis Co., Ltd. Competing interests The authors are employees of Samsung Bioepis Co., Ltd.
More info We thank Laurel Riemann, PharmD, BCPS and Julia C Jones, PharmD, PhD, MWC, of Med Communications, Inc, for their writing assistance.